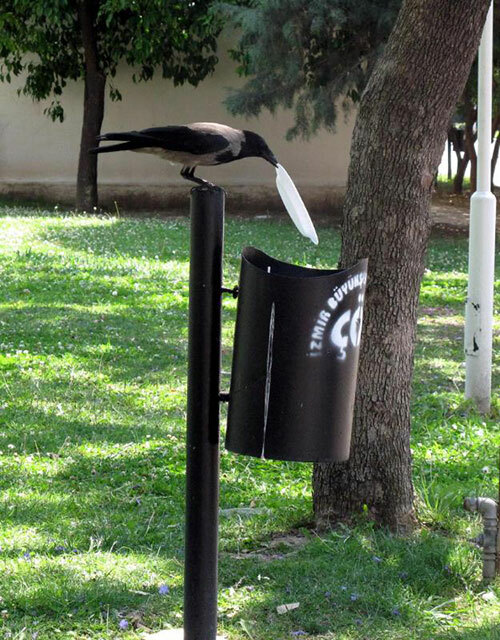 Having grown tired of being referred to as dirty and messy, one hooded crow in Izmir, Turkey took matters into its own beak to help make its park a little cleaner. 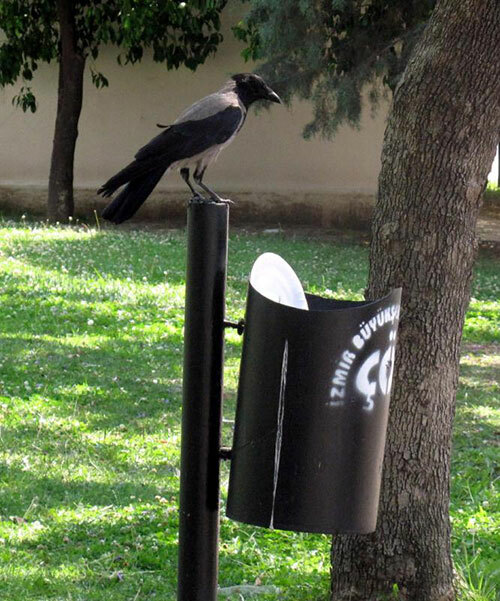 According to the Turkish Newspaper, Radikal, after eating the leftover rice the crow flew over and dropped the used plate in the garbage bin. What could explain this amazing act of social and environmental prowess? 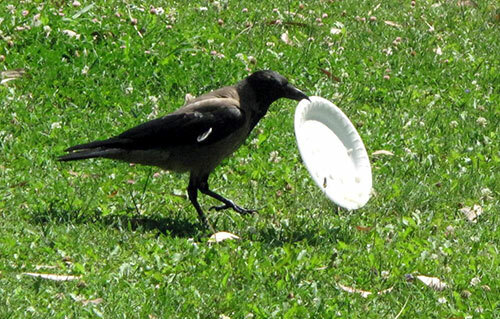 I often see crows take food wrappers or packages up to a perch and then drop them once they’ve fished out all the crumbs. Could be that this crow was simply in the right place at the right time to turn this typical behavior into something extraordinary. Then again ¯\_(ツ)_/¯ . We’ll never be able to say for sure what this crow was thinking, maybe it just got tired of all those litterbug people mucking up its park! I feed hooded crows in the gardens near my office. Sometimes, the parents wash food in the puddle under an air-conditioner, before passing the soggy mush to a fledgling. To help, I’ve tried laying a plastic cup of water beside food offerings. After a few trials, the adults discovered how to dip food into the cup, and they can also drink from it. They do spill the cup occasionally. The youngsters are much clumsier. Yesterday, near the end of the meal, one of the adults put the (empty, toppled) cup back upright before wandering away. Maybe that’s less impressive than the clean-up crow in Turkey, but I wonder whether they share the same urge for neatness? The fledglings often play with sticks, grass, or bits of debris on the ground, but (to me) this doesn’t seem as purposeful as the adult rectifying a cup. Slight rain is forecast here tomorrow. I’ll try something. I have 4 identical plastic cups. I’ll toss them onto one of the flat roofs where the crows exploit the air-conditioner. I’ll check the scene intermittently to see whether the crows interact with the cups. Sometimes I’ve tried leaving cups in the garden and car-park where the crows descend for food. The cups don’t last long, because of the wind or janitors. The roof might be better, because it is only accessible to birds. Thanks for the article about crow play. I’m regularly fascinated to watch a fledgling frolic around. I can’t always understand the purpose of what’s happening, but the bird seems happy. It’s something that they only do after a good feeding. If I keep a low profile, by sitting down on the ground, the youngster eventually wanders within arm’s reach, giving me a clear view. In your 7-point list, I mainly see “object play” and “play caching.” Picking up and dropping a twig. Probing the edges of a cobblestone that cannot be moved. Hiding something (maybe leftover cheese), wandering away for a few minutes, and then “discovering” the hidden item again. In today’s session, the fledgling found an old doormat halfway buried in the grass, and poked at the fibres curiously. There are 2 fledglings in this family, but the parents somehow deploy them to opposite parts of the garden. Lately I only see *one* youngster feeding or playing at a time. The other one remains on a tree branch or roof (while the parents keep shuttling food over there). I saw both fledglings together on the roof (briefly) this morning; and last weekend I snuck past before dawn and saw them all sleeping together in the same tree. It’s difficult to observe them without being noticed and causing interaction. If I approach the building on two of the four sides, the nearest fledgling usually sees me and starts begging to the parents. Hi, we have a crow that visits about 3.30 in the afternoon. We throw him a slice of bread and he either takes bits to soak in our bird bath and then eats them or breaks smaller pieces and then takes them to the lawn, makes a hole, places them in and then covers the hole with grass pulled up. He distributes the bread in small pieces all around lawn and under leaves. Why and is this learnt or inate behavior? ?